Product #2304 | SKU BEPODCASTUDIO US | 0.0 (no ratings yet) Thanks for your rating! Looking for a new way to express yourself? Ever wanted to be a famous producer? Then podcasting is the answer and the BEHRINGER PODCASTUDIO bundle has all you need to make high-quality podcasts and home recordings. 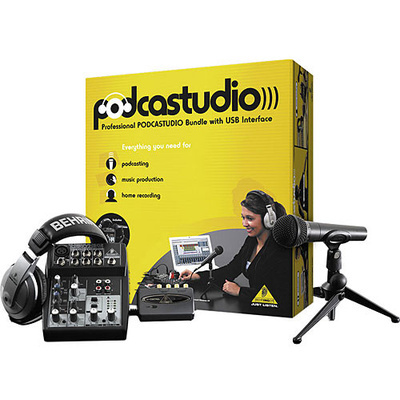 Go on air straight out of the box with this fantastic PODCASTUDIO recording package. It comes with a studio-grade USB audio interface as well as comprehensive DAW and podcasting software. The package also features a professional 5-input mixer with 2-band “British” EQ, high-quality headphones and a dynamic broadcast-style microphone plus cable.